For a very long time, I've wanted to get a higher end touring bike to make my main ride. My biggest problem... I'm kinda cheap and don't want to spend the kind of money it takes to get a Rivendell or other custom frame. I love lugged frames made of steel. Good steel. I have a Surly Crosscheck that is a great bike, but it's a TIG welded frame and, well, I'm kind of a snob about it I guess. 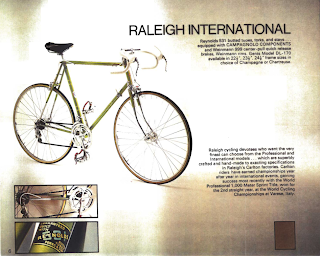 Once I started getting into old Raleigh's, it was only a matter of time before my eye would be caught by the International. 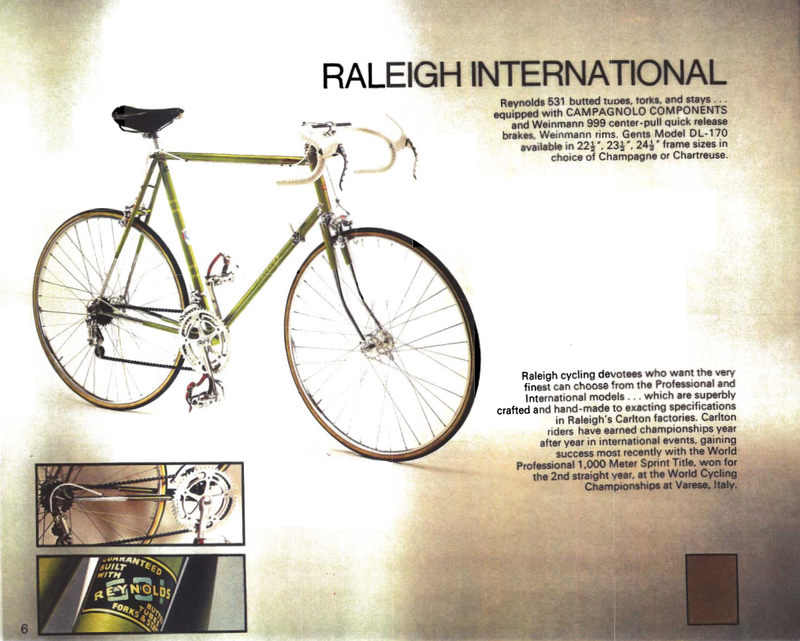 The DL-170 International was the top of the line touring frame made by Raleigh Carlton in the 1970s. Yes, the Raleigh bike most people would call the true "top of the line" from that time was the Professional. But the fact is the Professional was the same as the International except for a few facets: the Professional had Campy brakes, it's frame was a tighter racing geometry and it had slope shoulder fork crown. The International had Weinmann 999 center-pull brakes, flat chromed fork crown, and a more relaxed geometry designed for more comfortable touring. Both frames were made of double butted Reynolds 531 steel, arguably the best in the world at the time. Both were outfitted with a full set of Campy Nuovo Record (with the exception of the brakes, mentioned above). My searches on eBay and Craigslist were not very fruitful... for years... Too much money (a top condition International can go for north of a grand) or too many dents and scratches. That changed a couple months ago. An add popped up on the local Craigslist for a green 1973 International with a few replaced parts (Shimano changers, brakes and such). The ad was posted by a gent just down the street from me, so I went to see it. "Sorry," I said. "it's just too small." "You know what... I have another one of these I just got from a guy down the hill. Champagne and 23.5 inch. It's a bit large for me... Hang on, I'll go get it..."
Now I'd come with $400 for the green one without all the parts. $600 more for a bike I'd always wanted, but couldn't cough up the money for.... Still $1000 is a LOT of money for a bike. "Can't do it... Sorry. That's just too rich for me..."
"How about I knock off $200 and you leave me the saddle..."
I have tons of Brooks saddles. The serial number on this bike is A4545. There is a TON of information about these bikes at a great site called The Headbadge . It seems that this serial number is NOT a lot of help in determining the age of this bike. It is probably a 1973 given the lugs that are being used, the wrap-over seat stays on the seat cluster lug and the decal set. Yesterday was it's maiden voyage of any significance. The weather was nice. Still a bit cold, but not soaking wet. I took her on a 17 mile ride around Mercer Island. The International handled like a dream. Very responsive and, like other higher end steel frames I've had the pleasure of riding, powerful. Every ounce of energy put into the pedals seems to translate to forward movement. There is no sluggishness to the ride. Overall, I'm very pleased. I plan on making this bike my "main ride" for some time to come! PS: Know anyone who wants a nice Crosscheck? Once you have traveled the voyage never ends, but is played out over and over again in the quietest chambers. The mind can never break off from the journey. Happy to hear that it worked out nice for you. Enjoy. I recently purchased a 1983 Record Ace frame and fork and got the same feeling as you about the ride. I have other bikes but intend to make the Record Ace my main bike. The Record Ace has been around for a long time and made it's way up and down the hierarchy. It too is full Reynolds 531 like the International but without the chrome and Nervex lugs. IMO the '70's '80's Raleigh's were among the best.